Donald J. Trump is now the 45th president of the United States of America. 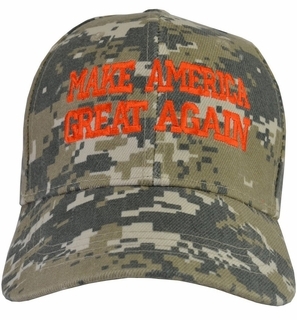 Get your Desert camouflage print Make America Great Again baseball cap to show your support for returning our nation to greatness and the policies of our new Commander-in-chief. Quality embroidered on the front by American embroiderers is MAKE AMERICA GREAT AGAIN in orange letters. One size fits all with an adjustable back strap. Made of 100% acrylic.